Stephen F. Eisenman is Professor of Art History at Northwestern University, Evanston, Illinois, and author of The Cry of Nature — Art and the Making of Animal Rights (Reaktion; 2013). This is a fascinating read, which, I believe, deserves the attention of advocates and scholars alike who care deeply about animals, and why I wanted to interview him. 1. 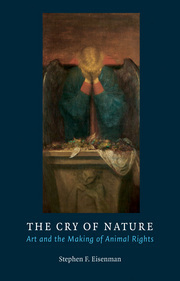 What inspired you to write The Cry of Nature – Art and the Making of Animal Rights? I have been a vegetarian for 25 years and a vegan for about five. In addition, about ten years ago, I started to become engaged in the relatively new research field of Animal Studies. But the real impetus for The Cry of Nature came in 2008. After publishing a short book about the photographs made at Abu Ghraib prison, (The Abu Ghraib Effect, 2007) I realized that the issue of human rights and animal rights are essentially the same! Animals like humans are sensitive and empathetic. Both require love, freedom and companionship to thrive. Yet both have been systematically denied these things by kings, tyrants, presidents and regular people willing to look the other way. In addition, the great artworks we see in museums generally show dead animals or slabs of meat as both natural and beautiful! I wanted to write a book that would make that violence strange again. I also wanted to highlight the work of artists who rejected violence, anthropocentrism and the turning of sentient beings into mere commodities. 2. The book’s subtitle is ‘Art and the Making of Animal Rights.’ How did artists help inaugurate the animal rights movement? In the 17th C, the painter Rembrandt rejected the Cartesian distinction between body and soul, and between human and animal. He showed the latter – even in death – as possessing of a soul. So did William Hogarth and George Stubbs in the 18th century, and the French Romantic, Theodore Gericault in the 19th. 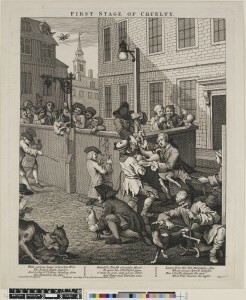 Hogarth in particular was cited by the philosophers of the late 18th Century who started the modern animal rights movement. Without Hogarth, John Oswald and Joseph Ritson – both pioneers of animal rights – would never have written their books. By the way, the title of my book derives from Oswald’s amazing, radical, but little-read 1791 manifesto, The Cry of Nature – or An Appeal to Mercy and to Justice on Behalf of the Persecuted Animals. 3. Which works by Hogarth do you mean? There is of course, his great portrait of his pug dog, Trump! But more important are the great engravings called The Four Stages of Cruelty. The first two prints are a veritable encyclopedia of animal cruelty and were intended to shock the conscience of viewers. And they did! Of all the works he made, Hogarth was the most proud of these. 4. What is your view of 20th and 21st century artists like Pablo Picasso, Chaim Soutine, Francis Bacon, Damien Hirst, and Sue Coe? How did they depict animals? Kim, that’s a big question, and readers will have to look at my book for an answer. But I will say that excepting Hirst, they all rejected in one way or another the cruel clichés of speciesism. Coe of course is the greatest moralist-artist active today. She proves that you can be both brilliant at your craft (drawing, painting, printmaking) and a powerful force for social change. She has single-handedly made more vegans than all the animal welfare groups put together! 5. Is the focus of your current research animal rights? If so, what can you say us about it? Yes, I can’t leave it behind. I am writing about animal agency in the late 18th Century and after. In all previous emancipation struggles, the oppressed group has fought for its own freedom. I have discovered that animals – for example the ones brought to Smithfield Market in London — did that too, and that their oppressors recognized it. I know this sounds a bit crazy, but I am a careful scholar and I have the evidence! Rampant bulls at Smithfield killed in order to obtain their freedom. Sheep cried out in such a plaintive way that they attracted human supporters. I am giving illustrated lectures about these subjects at conferences this year in England and the US, so please come and hear for yourself. But Kim, as you know so well, scholarship is not enough. I am becoming more and more engaged with activism. For me, the one supports the other, and I am trying to teach my students at Northwestern the same lesson. The best scholar is the engaged scholar. PS Here’s a video of Stephen giving a talk to the Chicago Humanities Festival which outlines what he explores more fully in his book. I find it to be important and fascinating research and analysis that’s relevant to understanding our complex relationship with other animals.